For a week now, I’ve been indulging in the treats of the season. It started with paczki on Fat Tuesday and then my valentine wined and dined me on Thursday at an authentic Italian spot with fresh pastas and the best seafood. On Saturday, I went to an Oscar movie marathon from 9 am to 10 pm. I packed healthy snacks in my little cooler, but still couldn’t resist sharing popcorn and other concession stand junk food with two of the best movie dates a girl could ask for: Meg, my fun future sister-in-law and Emily from Tar-Tryin’! Emily (who is super awesome, by the way) stayed the night because she lives a few hours away and of course, I had to make her something good for breakfast. We shared some Bacon Waffles with Maple-Blueberry Syrup. I try my best to balance out indulgences with hot tea, breakfast smoothies, salads, healthy home-cooked meals and long walks. 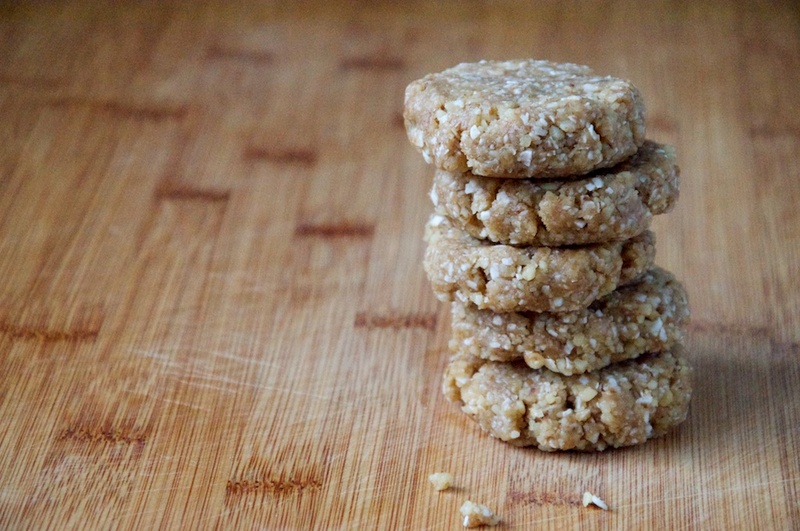 Another balance trick I recently acquired is this recipe for raw, vegan and gluten-free cookies. I’ve been keeping a stash of them in the freezer and when I run out, it’s easy to make another batch. They are a miracle if I come home from work hungry and dinner is still an hour or so away. They satisfy a sweet craving without the carb-overload or sugar crash. They’re like magic. I love the hearty, nutty and lightly-sweet taste. If you like to sneak raw cookie dough, these are for you. You can even try adding chocolate chips. Marc, who doesn’t particularly like walnuts or honey, loves these cookies. I haven’t tested it, but I’m pretty sure kids would gobble these up, too. Have I convinced you, yet? Use real maple syrup to make these vegan or use honey. I’ve tried them both ways and I love both versions. I prefer using the large flake coconut because I liked the resulting texture from the irregular coconut pieces, but regular shredded coconut works great, too. I thought these were too sweet with a full 1/4 cup of maple syrup or honey, fill the 1/4 cup only 3/4 of the way, if you’d like them less sweet. If using large flake coconut, add to a food processor and process until broken down into slightly smaller, but irregular coconut pieces. If using shredded coconut, add to the food processor with the other ingredients in step 2. Add walnuts, maple syrup (or honey), vanilla and salt. Process until combined. Roll dough between your hands into 1 inch balls and place onto a rimmed baking sheet with parchment. Use your hand to press the dough down and shape into a cookies. Transfer baking sheet to the freezer for an hour or so. Transfer to an airtight container and store in the freezer with parchment in between each layer of cookies for up to two months. Just started a gluten, dairy, and soy free diet this week so I am looking forward to trying these! In fact, I think I’ll make them tonight. Laura – I hope you enjoy them as much as we did, Laura. I think they’ll be a nice treat while you are staying away from gluten/dairy/soy. An Oscar movie marathon sounds like so much fun! I am pretty fidgety, so I’m not sure if I could sit still that long, though. 🙂 The cookies look like a real (healthy) treat. Jess – Thanks! The movie marathon is not for everyone, for sure 🙂 I like that it’s in February when we don’t usually have a lot going on. It’s kind of crazy, but always fun. Day 51 of my gluten dairy free lifestyle. Leave it to Nicole to spice it up! Cannot wait to try!! Nancy – I think you’ll love them! These sound so good, Nicole. I’m not so into raw treats that are sweetened with dates, but maple syrup? I’d love these! Kathryne – Dates are touch and go for me, too. I’m trying to experiment a little with them, but real maple syrup is my favorite natural sweetener! oh how yummy! and simply too easy not to try. i love all of these flavors and i’m happy to see that i’m not the only one who subs out honey for maple syrup when the vegans come over! Molly – So easy, right? Maple syrup is such a champ in recipes like this! Katherine – I did make these once with pecans and they were delicious! Sues – It is really fun. If you have AMC theaters near you, there might be a participating Best Picture Showcase! Kasey – Meeting Emily was so fun! My treat phase was a bit too long, so I just made another batch of these cookies to keep me honest. Oh man, a chocolate chip cookie sounds good. D’oh! Hey! Sorry for the late reply to this! It’s been a busy busy few weeks! I HAD SO MUCH FUN with you! I’m still talking about those bacon waffles – I actually had a dream about them a few nights ago. They’re that magical! I look forward to you guys heading over to Kalamazoo for a visit! I hope you’re fitting in some fun time during your busy time! It was a blast! Next time I’ll make you beer waffles 🙂 Yes! We must get to Kalamazoo and meet up at the Woodshop, too!